NEW ZEALAND — Defiant Mapua artist Roger Griffiths today made a stand against Westpac by withdrawing his $190,000 savings in $20 notes. 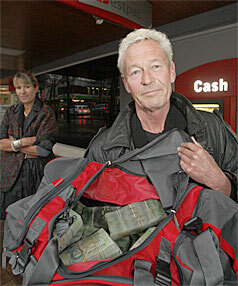 The bank provided a red-and-black carry bag to take away the cash after meticulously counting it in front of Mr Griffiths at its Nelson branch. Mr Griffiths, a loyal Westpac customer for 25 years, decided to withdraw his money after the bank rejected his application for an $80,000 mortgage. "It's about time normal people took a stand." He said the bank turned down his application because he did not have a regular income as an artist. However, he was a successful artist, exhibiting his paintings at the World of Wearable Art complex, in Christchurch and New York, he said. He wanted to buy a $385,000 property in Mapua, had $200,000 in cash and was going to sell his $110,000 campervan. That more than met the bank's criteria for a 20 per cent deposit, and the property which included a home and commercial premises would have returned $500 a week, he said. He was disappointed when his loan application was rejected, but it was Westpac losing $111 million to Lane Walker Rudkin Industries that tipped his decision to withdraw his money. "They can lose $110 million with LWR but turn down a normal customer who has never missed a loan payment," he said. "If they don't have the trust in me after 25 years, there's a problem for Westpac." Having decided to withdraw his money, he then decided to make it hard for the bank by requesting payment in $20 bills. He said the Nelson branch told him it did not have that amount and he would have to also go to other branches at Stoke, Richmond and Motueka. However, he insisted the bank have the money ready to collect at 9am today. He then took it to the Nelson Building Society, saying he would rather deal with NBS because it was part of the community. His message to Westpac: "If you don't support the community, the community won't support you." Mr Griffiths' protest comes after a series of embarrassments for Westpac. On Tuesday its former Alexandra bank manager admitted defrauding the bank of more than $400,000, and it has been left red-faced over the slip-up that allowed $10 million to be wrongly credited to a Rotorua service station co-owner who had since fled to China. Westpac media relations manager Craig Dowling said today that when the bank lent money it required certain information to be provided to enable that lending to be done prudently. "It's about providing evidence of an ability to meet regular repayments." In Mr Griffiths' case that information was not provided for it to be assessed, he said. Mr Griffiths' withdrawal was disappointing. "We would like to welcome Mr Griffiths back. We just need the confidence regular repayments can be met." Wow, Obamacare will outlaw creation of new private health plans! I am just blown away by what I have just heard. Apparently, an Investor's Business Daily article claimed that Section 102 of the House health legislation would outlaw private insurance. That section of the bill allows existing private health plans to be grandfathered into law, but there is a complete prohibition of any new private health plan. That is more than alarming. It is a government out of control and a government that aims to completely take over our lives, from birth to death. They are aiming to play God, by controlling whether we are approved coverage or denied -- whether we live or die. So yesterday Pres. Obama held a telephone conference call with liberal bloggers, because I guess he feels that they will go spread the gospel about his plan, just by hearing the sound of his voice. In the call one of the bloggers questioned him on the section of the bill outlawing private health plans, and Obama actually answered that he wasn't familiar with the bill (!!) . That in itself is shocking. After he said how he wasn't aware of what was in the bill (the same bill that he said needs to pass quickly -- I guess he doesn't need to read the bills he signs), he said that the most important thing to him in the health bill is that anyone who currently has a plan will get to keep that plan. But wait, that doesn't answer the question. We already know that people with a plan get to keep it, because the bill grandfathers in all existing health plans. It's the CREATION OF NEW PRIVATE PLANS that is the issue. Now everything Obama has been saying all along makes sense. You know that mantra he's been repeating all along, about how people with private plans will have the option to keep it? Everyone has been taking that to mean that private health insurance will continue to be an option. But that's not true! Now, aftering reading about the section in the bill outlawing new private health plans, and hearing Obama's carefully-worded mantra about keeping your existing private plan, it is clear as day that Obama's plan will absolutely eliminate and prohibit any private health plans from the day it is signed, and every single person will have only one option for their health: the government. If I didn't hear the actual recording of Obama I may not have believed it, but it is available online right now for anyone to hear. If you scroll down in that article you can play the entire Obama conference, which is somewhere around 20 minutes in length (audio only). It is well-worth a listen! The key part comes at just before the 17-minute mark, when a blogger from Maine asks Obama about private insurance being outlawed. USA Today has an article today about Obama's poll numbers sinking even faster than Carter's did. The American people are starting to awake from their hypnosis and realize that someone is attempting to install Socialism in their great country. 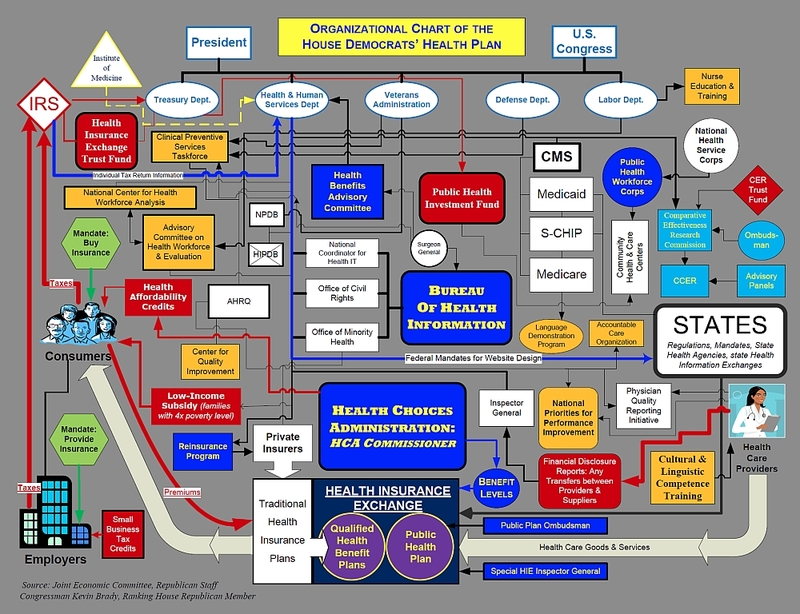 This is the organization chart being proposed right now by Democrats in congress to control the government health plan (i.e., socialized medicine, socialism). This is what they are trying to ram down our throats within weeks as the solution to fixing high health care costs. This is shameful and wasteful, and those supporting this nightmare truly don't care what happens to their country. Sorry, just telling it like it is. If you don't agree, then frankly you don't understand it. There is no rational explanation for it other than accumulating all power in a central government, exactly as all tyrannies around the world have done throughout history. Mark my words: the implementation of this socialized medicine plan will be one the primary linchpins that destroys this nation. This will make the goverment-owned car companies (GM, Chrysler) look like peanuts in comparison. If you oppose anything, oppose this. Can those babies skate or what? It's always nice to see things demonstrated, rather than just reading about them.